Thank you for choosing Eleaf products! Please read this manual carefully before use so as to use correctly. If you require additional information or have questions about the product or its use, please consult your local agents, or visit our website at www.eleafworld.com. For more detailed instructions, please find tutorial video at: www.eleafworld.com/video/. Power on/off: screw off the battery cap, and remove the insulating piece from the negative side of the 21700 battery if the package you purchased is the one that includes a 21700 battery. 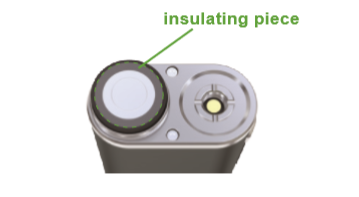 Then install a high-rate 21700 battery (positive side down and negative side up) or a high-rate 18650 battery (positive side down and negative side up) with the battery sleeve into iStick Pico 21700 and finally screw the battery cap on. The device can be powered on/off by pressing the fire button 5 times. 1. Please be careful not to use battery with torn casing as it is a safety hazard. 2. Please make sure you are using high-rate 21700/18650 battery whose continuous discharge current is above 25A. 3. Please choose the correct mode and adjust the wattage to a proper range according to your atomizer before use. 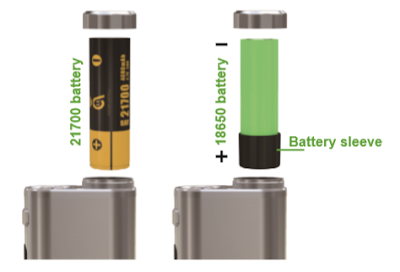 the 21700/18650 battery can be charged in the device through USB port via wall adapter or a computer or charged with an external battery charger. when the device is powered on, you’re free to switch the vaping modes among VW, Bypass, TC-Ni, TC-Ti, TC-SS316, TCR-M1, TCR-M2 and TCR-M3 by repeating 3 quick clicks of the fire button. in VW mode, the wattage can be adjusted by pressing +/- button. Keep holding +/- button to increase/decrease the wattage rapidly. In TC (Ni, Ti, SS, TCR-M1/M2/M3) mode, first press the fire button 4 times in quick succession and then press +/- button to adjust the wattage. Adjust temperature: in TC (Ni, Ti, SS, TCR-M1/M2/M3) mode, simply press +/- button to increase/decrease the temperature setting. press the fire button and + button simultaneously to enter set menu, and you’ll be able to lock/unlock coil in TC modes, set stealth on/off, choose a parameter to be displayed on main interface, turn on/off custom logo, check battery status and firmware/hardware version of the device, activate/deactivate preheat function in VW mode and set TCR value in TCR (M1/M2/M3) mode simply by pressing +/- button to move or adjust and pressing fire button once to confirm your choice. After settings are complete, just move to EXIT and click fire button once to confirm and go back to the main interface.